We receive a lot of questions from contractors about our process and product. This blog post has the answers to some of our most commonly asked questions. Have a question that isn’t answered here? Check out our Help Center for more FAQs! If you don’t offer financing, you’re limiting the number of deals you can close. 58% of Americans have less than $1,000 saved. They might need your services — but don’t have the cash on hand to pay for it. By offering them financing, you’re enabling them to receive the funding they need to start the project now and to pay back the funds over time. Address a “can’t wait” project (like a leaky roof) when they don’t have enough cash on hand to pay for it out of pocket. Enjoy the ease of monthly payments rather than taking a lump sum out of their bank account at once. By offering financing options, you can appeal to these homeowners, expand your customer base, and grow your business -- and your bottom line! No, Hearth is a software that helps contractors offer personal loans to their clients quickly and easily. Banks and other financing institutions can take weeks to process and approve a loan application. Homeowners may spend valuable time and energy applying for a bank loan, wait weeks for an answer, and then scramble to find another source of funding if their application is rejected. With Hearth, homeowners can see their loan options within 60-90 seconds without any effect on their credit score, can apply for the loan right on the lending partner’s website, and receive the funds within 1-3 days. Personal loans are the financing option that homeowners find through Hearth. With personal loans, homeowners receive the funding upfront and pay it back in monthly payments over a set period of time. This type of loan doesn’t require any home equity and can be used for any sort of project, whether it’s HVAC, roofing, landscaping, or something else entirely. What is Profit Protection Financing? Profit Protection Financing is a type of financing focused on protecting your profits. Because Hearth offers Profit Protection Financing, we don’t charge you any per-loan dealer fees. Instead, every cent you make stays with you. Other financing companies offer Buy-Down Financing where you, as a contractor, buy down your client’s rates to show them lower rates than they would’ve seen otherwise. You’ll typically be charged about 7-15% of every job: a cost known as a dealer (or merchant) fee. That amount comes out of your profit margin and goes to a third-party financing provider. 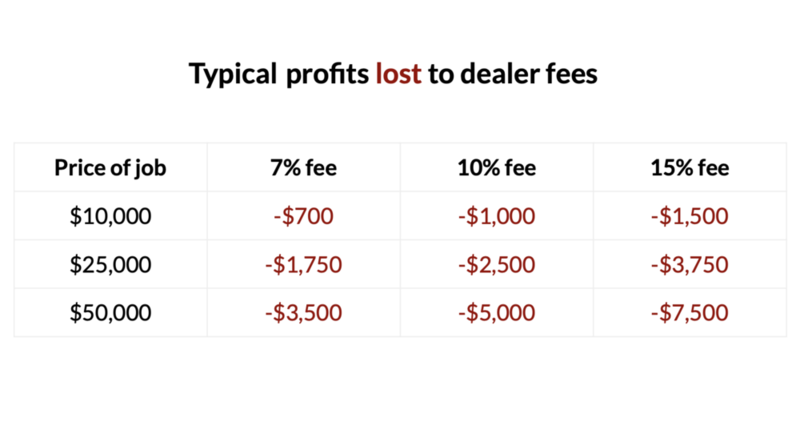 The following chart shows you how much you could lose in dealer fees — after just a single job! For more information on the different types of financing, check out The Contractor’s Handbook: How to pick the right financing option to grow your business. What rates can my homeowner expect with Profit Protection Financing? If you offer Profit Protection Financing through Hearth, your clients can expect to see the following rates. The majority of clients will see options with APRs in the ranges listed below, but some may receive options with lower or higher APRs. Exact rates depend on your client’s financial profile and the lending partner’s unique model. Why do the funds go to the homeowner and not to the contractor? Hearth doesn’t want you to be liable for the loan. If the loan isn’t paid in time or in full, the lending partner will work directly with the homeowner so you don’t have to worry about fielding calls, following up with clients, or managing paperwork. Why don’t you offer 0% options? There are a couple of reasons why you won’t find 0% loan options through Hearth. We don’t want to charge you dealer fees. If you offer homeowners 0% options, you’ll be covering the interest that they would’ve paid. You’ll be charged dealer fees to cover that amount. Option 1: The homeowner finds a financial partner through Hearth who provides a set rate of 13% throughout the duration of the loan. Option 2: The homeowner finds a financial partner who provides 0% financing for 12 months and 17.67% for the remaining 48 months. The homeowner decides to pay back the entire loan within the 0% promotional period. Conclusion: If the homeowner picks Option 1, they will be paying more in interest, but they’ll also be paying $600 less per month than they would if they picked Option 2. With Option 2, the homeowner will be able to pay off the loan within a year and without any interest -- but you might be covering their interest. The 13% interest that they would’ve normally seen may come out of your pocket -- and cost you $1,300 (13% of the $10,000 job). Why does Hearth have a subscription fee? Hearth’s annual subscription allows you access to unlimited loans with no dealer fees. We also have other features that allow you to offer financing quickly and easily. Once you fill out the form, you’ll receive an email from a member of our team with steps on how to refer and when to expect your rewards. We have a dedicated Customer Success team who are on-hand to answer any questions that you or your homeowners have. The response time will vary based on your subscription plan but will be no more than 48 hours. Have a question we didn’t answer here? Visit our Help Center for more questions and answers.